What It’s About: Michael Myers (Nick Castle/Tony Moran) escapes from a sanitarium on October 30th. 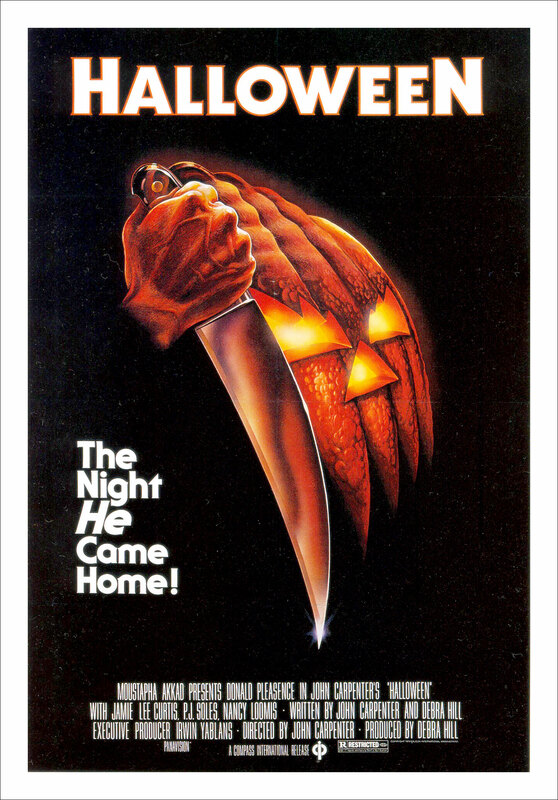 His doctor, Sam Loomis (Donald Pleasence) believe he will travel back to his hometown to murder again on Halloween night, fifteen years after his first murder. Meanwhile, smart, likeable teenaged babysitter Laurie Strode (Jamie Lee Curtis) is seen by Myers when she drops her real estate agent father’s keys off at Myers’ now abandoned house. Myers begins stalking her and her friends Annie (Nancy Kyes) and Lynda (P.J. Soles) as they prepare for Halloween night. Will Loomis find Myers, and when he does, can he stop him before he kills again? Will Laurie realize the truth about what her charge Tommy Doyle (Brian Andrews) calls “The Boogeyman” before it’s too late? Why Watch it Today? : Tonight is Halloween, since childhood my (and probably every other horror and costume party junkie’s) favorite holiday. Watching Halloween on Halloween night (or nearby, when that’s not possible) has been my tradition nearly my entire life, though in the early years it was more “see the first hour or so edited for TV in the background while trading candy with my cousins at Grandma’s house”. It is in fact one of the main reasons I thought a calendar like this is a great idea, for I’ve enjoyed that tradition. If you’ve seen Halloween before, or know its reputation via the terrible sequels and Rob Zombie’s remake, try this. Just as your last trick or treaters are trickling in (I like 8 or 9pm) turn off every light in your house. Let your only light be from a Jack O’Lantern and maybe a candle or two. Get yourself some popcorn and what’s left of the Halloween candy. Now, turn on this film. Don’t think of the terrible sequels or the years of retcons and explanations about Myers’ true nature and forget years of rip-offs where we all learned that every killer is unstoppable, and every killer comes back. Just imagine this is just about some teenagers being stalked by a holiday obsessed madman who is himself being hunted like a white whale by an obsessed,warning spouting psychiatrist that no one listens to. That psychiatrist? He’s very right about Mr. Myers. I can almost guarantee you a great time. This entry was posted in Horror, Independent, Movie of the Day, Slasher, The Original, Thriller and tagged abandoned house, annoying children, Arthur Malet, asylum, baby sitters, Blue Oyster Cult, boogeyman, bullies, Charles Cyphers, Compass International Pictures, Dean Cundey, Debra Hill, dogs, Donald Pleasence, final girl, graveyard, Halloween, homecoming, Irwin Yablans, Jamie Lee Curtis, John Carpenter, killer in the back seat, Kyle Richards, marijuana, Moustapha Akkad, Nancy Kyes, Nancy Stephens, P.J. Soles, psychiatrists, sheriff, sorroricide, Tommy Lee Wallace, unstoppable killer, urban legend.